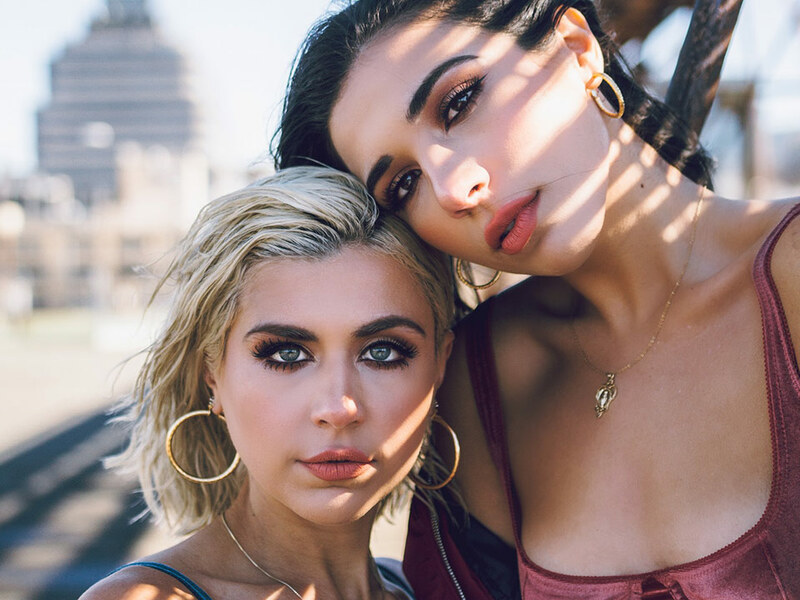 Check our interview with the talented Indie Pop Duo RUUMER who just released their new single “Gimme Some” (featuring Sammy Adams) along with the music video. Gimme Some is a vibey, anthemic jam that is all about empowering women’s sexuality. Inspired by RUUMER’s Catholic school upbringing, it is essentially a satire on the sexually oppressing environment of their youth. The record has a theme of juxtaposition as you hear a choir inspired beat with the girls’ playful vocals praying to God to “get some” tonight. After their previous singles, “House of Cards” and “Heels”, gained praise from outlets such as Idolator, Perez Hilton and Galore, the girls are extremely excited to share their new music. Hi girls, please tell us a little about RUUMER? We’re Melis and Jess, and we’re an Indie Pop Duo known as RUUMER. As sisters, our music is deeply inspired by strong, badass females. We just released a new single called “Gimme Some” feat. rapper Sammy Adams. It’s a vibey, anthemic jam all about empowering women’s sexuality. Describe RUUMER in 3 words? Who has made the biggest impact on your lives so far, and why? Definitely our parents. They have been so supportive throughout this entire journey. They introduced us to music at an early age and have always promoted us to cultivate our creativity and follow our dreams. Even now, they continue to encourage us to think outside the box and remind us that we can do anything we dream of. How did you guys get started in the music business? Music has always been our passion. We grew up in a musical household and were always singing and dancing around the house. As kids, we started doing musical theater and loved performing and being on stage. That’s actually where we felt most comfortable and confident. We then started commuting in and out of the city, working with a vocal coach and going on auditions. We always loved writing, we had journals full of lyrics and poems. We started writing/recording when were 12 and 15 and fell in love with working in the studio and creating music. We wanted something mysterious and alluring, something that didn’t limit us creatively. We came across the name “Rumer” and it means gypsy. We have always identified with being gypsies, so the name felt really authentic to us and to the music. We added another “U” for the two of us and we came up with the name RUUMER. Who influenced you and why did you guys choose to make music? We always knew that this was our path in life. As little girls we looked up to artists like Britney Spears and Christina Aguilera. We were in love with pop music and always will be! When we were teenagers we started writing and recording and that’s when it really became a career for us. Every free moment we had outside of school was spent recording, writing, playing shows, etc. We’ve actually have had many musical incarnations before RUUMER came about. We’ve been performing since we were 3 years old, so at this point the stage feels like home! But a time we were definitely nervous was when we sang the National Anthem at a New York Mets game. It’s so different singing your own music versus singing the Anthem. You really can’t screw that up! Haha. So we definitely had some nerves going that day. What is your next goal as musicians? To continue putting out more new music and more visuals, and to do a sold out US Tour. Performing live is our favorite thing to do, so we can’t wait to play some shows across the US. We plan on doing some shows in the New Year, so keep an eye out for those dates! We’ll definitely be doing stops in our city, NYC, as well as in LA. We lived in LA for 4 years, so we gotta show some the West Coast Some love! “Gimme Some” is a laid-back anthemic record that’s all about empowering women’s sexuality. It throws a wrench in the stigma that women should be ashamed to talk about our desires. Inspired by our Catholic school upbringing, it is essentially a satire on the sexually oppressing environment of our youth. We worked with a killer female director, MK Schneider, to create the video for the record. There are competing visuals of women being traditionally feminine and the new age confidence in being who you are no matter how you look, no matter what you like. It embraces all angles of the modern woman and shatters the stereotypes that they are given. What we can expect of RUUMER in 2019? Definitely more new music! We’re releasing another single early next year called “Downtown”, which we’re super excited about! We actually just shot the music video for the record a few weeks ago… the shots we saw so far look sick, so we’re pumped about that as well. What is you favorite song to belt out in the car for karaoke? Right now, anything from “A Star Is Born”! Lady Gaga is just the best. Melis: I’m an extremely passionate person. When I commit to something I’m all in 110%. It’s kind of like I’m all or nothing, so I really put my time and energy in when I feel strongly about something or someone. Jess: My ability to express myself is extremely strong. I am a very emotional person- when I feel, I feel with my whole heart and I know how to communicate my emotions. I examine them to understand myself and others better. As humans we are extremely intricate people with many layers, and I find that fascinating. I ask myself why I feel the way I feel and try to pick it a part. I’m really in tune with my emotions which makes me be better creatively and personally. For both of us, honestly just being able to do what we love to do everyday and making a living doing so. There have been times in our lives where we would be like “we just wanna sing!” but we only had $5 in our bank account. We had to get side jobs just to make ends meet, and couldn’t put all of our energy towards our music. We feel so fortunate right now to be focusing solely on our passion – music. Music is both of our first loves, but Melis also has a passion for acting, working out and fitness, and traveling the world experiencing other cultures. Jess is also a sick makeup artist, and has always had a passion for makeup as well. She actually does our makeup for all of our visuals (photo shoots & Music Videos), which definitely comes in handy! Jess also loves practicing yoga and writing poems. Before releasing “Gimme Some”, it had been a minute since we put out music so we’re super excited to share that we’ll be releasing more new music in the New Year! We have at least two more singles lined up that we feel really strongly about, so we’re pumped. As we mentioned earlier, our next single “Downtown” will be out in early 2019, so keep checking our page for that release date! It’s one of our favorites. How’s a typical day in RUUMER’s life? Normally we get up have our coffee, chill with our dogs, then hit a workout whether that be with our trainer or a yoga or SoulCycle class. Then most days we’ll go to the studio to do some writing/recording. If we aren’t writing that day, we may have a photo shoot or some meetings. We’re very hands on with our project, we do our own styling and creative direction so we’re always brainstorming and working on something! Coffee, Netflix, and hanging with the fam and our dogs. We both love salads and protein shakes. Melis: oh god, there are so many because I normally try to eat so healthy haha but I’d have to say pasta and pizza! Italian girl at heart. Melis: I’m a huge foodie, so he better bring me to a good restaurant! Jess: Someone who is continuously correcting me. It’s like, can’t you just let me live?! Melis: Cleopatra. She was such a badass female ruler. She used her sexuality to manipulate men and get to the top. I find her so fascinating, so I would love to pick her brain. Jess: Lady Gaga. I’m just so enamored by her talent and her rockstar energy. I would love to sit and chat with her about life in general. Does RUUMER support any charities? There are so many causes that we feel passionate about and would love to be a part of. Anything supporting Women, Women’s Rights, and Equality. We are also big supporters of the LGBTQ community, we truly believe that at the end of the day you should embrace who you are no matter what. We both struggle with anxiety and depression and would love to be a part of any cause to help raise awareness and eliminate the negative stigma of mental illness. How do you see yourselves in 5 years? Our main goal is to reach as many people as we can with our music, and to hopefully inspire them in some way. We would love to go on world tour, and obviously winning a Grammy has always been a goal of ours. We would also love to do more acting projects in the future, a movie musical type film would be a dream. How would you describe RUUMER’s fashion style? Love it! It’s so awesome to be able to connect with our fans through our social media pages and share what we’re up to everyday.